A section of Palatine Hill in Rome has opened to the public for the first time in centuries, allowing visitors to take in 1,200 years of the Eternal City’s history. 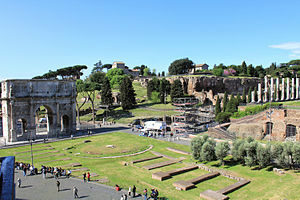 One of Rome’s seven hills, Palatine Hill overlooks the Roman Forum and the Circus Maximus in the city center, but the newly opened spot is a place where tourists can experience nature in the middle of the city. A mix of foliage, including plants that have overtaken the ruins, and animals lets visitors leave behind the hustle and bustle. A walkway takes visitors on an almost mile-long path through meadows and under olive, fig, oak, and pine trees. “It’s a return to the Grand Tour, when a few visitors could glimpse Rome’s entire history up close,” site manager Alfonsina Russo said. According to legend, the reopened site is where a tree sprouted in the eighth century BC after Romulus marked the boundary of Rome by hurling a spear into the ground. To commemorate the site’s opening, a Cornelian cherry tree has been planted at the alleged spear-throwing site, as well as other flora that grew on Palatine Hill in ancient Rome. Nearby is a grotto 45 feet underground that contains mosaics, implying that Roman emperors worshipped the site as the place where Romulus and Remus were raised by a wolf. Before it became a palatial residential complex in the time of Augustus (27 BC), Palatine Hill housed wealthy Romans. It also contains the recently reopened Farnese Gardens, a stadium, thermal baths, temples, and monuments. From the new site, visitors can see structures dating from the sixth century BC, including tuff stone structures, ruins of the imperial palaces, and the arched, 60-feet-tall reinforcements to the hill built by Emperor Septimius Severus in the third century AD. “Looking up at the hill from here, you really understand how the Romans’ use of arches and concrete kickstarted western civilization — we need to show this place to the world,” said archaeologist Alessandro D’Alessio.